(Nanowerk News) An international collaboration has succeeded in using synchrotron light to detect and record the complex 3D magnetisation in wound magnetic layers. This technique could be important in the development of devices that are highly sensitive to magnetic fields, such as in medical diagnostics for example. Their results are published now in Nature Communications ("Retrieving spin textures on curved magnetic thin films with full-field soft X-ray microscopies"). 3D structures in materials and biological samples can be investigated today using X-ray tomography. This is done by recording images layer-by-layer and assembling them on a computer into a three-dimensional mapping. But so far there has been no comparable technique for imaging 3D magnetic structures on nm length scales. Now teams from HZB and the Institut für Festkörperphysik / Technische Universität Dresden in collaboration with research partners from institutions in California (Advanced Light Source/Lawrence Berkeley National Laboratory, UC Santa Cruz) have developed a technique with which this is possible. They studied the magnetisation in rolled-up tubular magnetic nanomembranes (nickel or cobalt-palladium) about two layers thick. 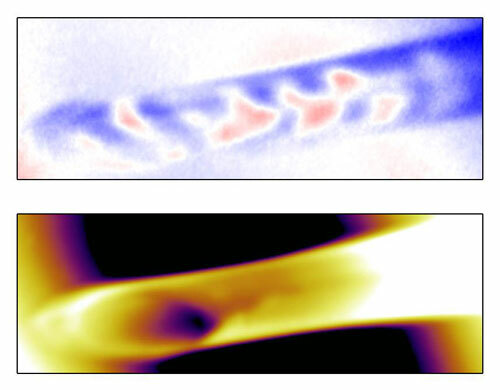 To obtain a 3D mapping of the magnetisation in the tubes, the samples were illuminated with circularly polarized X-rays. Using the X-ray microscope at the Advanced Light Source and the X-ray Photoemission Electron Microscopy (XPEEM) beamline at BESSY II, the samples were slightly rotated for each new image so that a series of 2D images was created. “The polarised light penetrated the magnetic layers from different angles. Using XPEEM, we were not only able to measure the magnetic features at the surface, but also obtained additional information from the “shadow”, explains Florian Kronast, who is responsible for the XPEEM beamline at HZB. In the end, the physicists were successful in reconstructing the magnetic features on the computer in three dimensions. The new method could be of interest to anyone involved with extremely small magnetic features within small volumes, such as those developing more sensitive devices for medical imaging, for example. Procedures like magnetoencephalography depend on externally detecting very weak magnetic fields created by the electrical activity of individual nerve cells – using appropriately sensitive detectors.